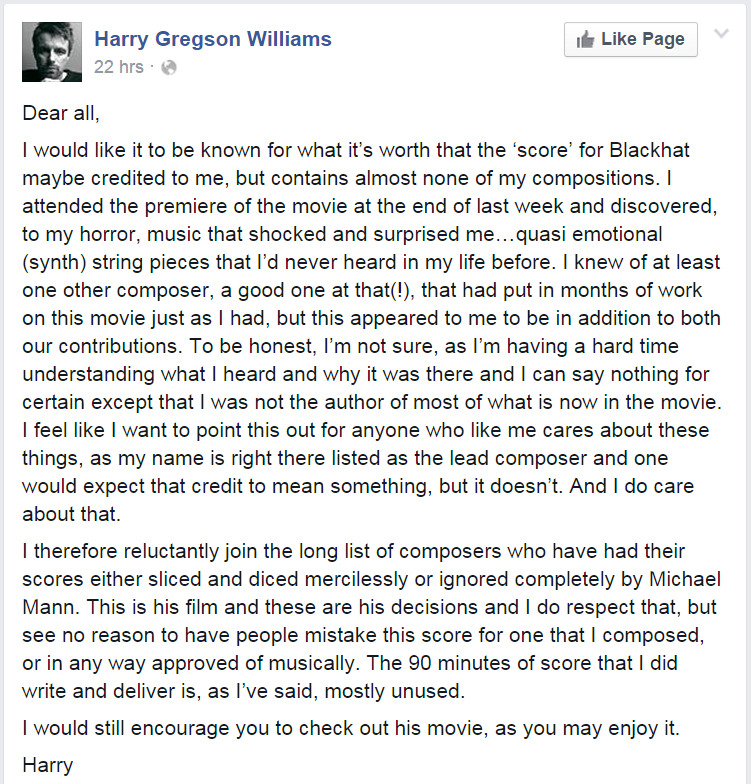 Film composer Harry Gregson-Williams has expressed his dismay after seeing Michael Mann's new film Blackhat, on which he is credited as lead composer. Taking to Facebook (Update: Facebook post apparently taken down, can be viewed here) Gregson-Williams said that the film "contains almost none" of the compositions he had prepared for it. The Brit later adds that he "reluctantly join[s] the long list of composers who have had their scores either sliced and diced mercilessly or ignored completely by Michael Mann." Gregson-Williams has been in the industry for 20 years and his credits include Shrek 2, Man on Fire, Prometheus and last year's The Equalizer. He has also worked on numerous iterations of the Metal Gear Solid video games series and has also worked on this year's MGS V: The Phantom Pain. I would like it to be known for what it's worth that the 'score' for Blackhat maybe credited to me, but contains almost none of my compositions. I attended the premiere of the movie at the end of last week and discovered, to my horror, music that shocked and surprised me...quasi emotional (synth) string pieces that I'd never heard in my life before. I knew of at least one other composer, a good one at that(! ), that had put in months of work on this movie just as I had, but this appeared to me to be in addition to both our contributions. To be honest, I'm not sure, as I'm having a hard time understanding what I heard and why it was there and I can say nothing for certain except that I was not the author of most of what is now in the movie. I feel like I want to point this out for anyone who like me cares about these things, as my name is right there listed as the lead composer and one would expect that credit to mean something, but it doesn't. And I do care about that. I therefore reluctantly join the long list of composers who have had their scores either sliced and diced mercilessly or ignored completely by Michael Mann. This is his film and these are his decisions and I do respect that, but see no reason to have people mistake this score for one that I composed, or in any way approved of musically. The 90 minutes of score that I did write and deliver is, as I've said, mostly unused. I would still encourage you to check out his movie, as you may enjoy it. Blackhat is Michael Mann's first feature since 2009's John Dillinger biopic Public Enemies. It stars Chris Hemsworth and concerns a dangerous and global cyber crime plot. The film is set for release on 20 February. Atticus Ross, who worked with Nine Inch Nails frontman Trent Reznor on David Fincher films The Social Network, The Girl With The Dragon Tattoo and Gone Girl, has also contributed to the film's score. Michael Mann is best known for his films Heat, Collateral, Ali and The Last of the Mohicans.